Happy Friday! I don’t know if it’s just me – or, has it been an especially long week for everyone? I thought nothing would be better to close out the week than a good cocktail! And, what better way to round out this week of blackberry posts than blackberry margarita? You guys know me, I always reach for the tequila first. To make the puree, add berries, sugar, and water to a blender or food processor and puree for 1 minute. Combine 1/2 cup sugar and 1 cup water in a small saucepan and heat until sugar is dissolved completely. Add puree, simple syrup, lime juice, orange liquer, and tequila in a small pitcher or carafe. Stir well to combine, and serve over ice with a wedge of lime. I usually don’t rim my glass, if I do I usually go with sugar instead of salt. I love me a good margarita! This one sounds amazing and since I’m going to go out and buy blackberries to make your gorgeous dessert from yesterday, why not just save some and make this, am I right?! Its been a long week for me too – always getting back from a vacation is hard 🙁 let’s hope next week is better! Oh yum, your margarita looks so good! 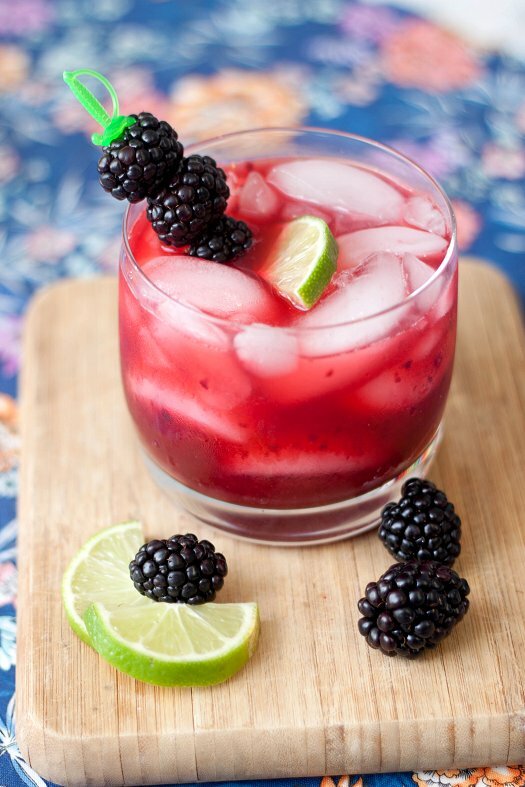 I love the photo and blackberry margaritas sound delicious! Perfect timing – it’s almost happy hour! These look fabulous. I tend to find blackberries so so seedy, that even though they taste great and have such special color, they come out lackluster to me. Did you find your drinks were seedy? Yum, this is perfect for the weekend! The color of the margarita is just stunning, great photo too! This looks so refreshing and the color is gorgeous! Margaritas are my husbands favorite, so I will be making these soon. Thanks! Looks yummy nice end to a long week! I see simple syrup in the directions, but not ingredient list – how much? To taste – start with a tablespoon and go from there! I made these tonight! Absolutely delicious & very easy to make!! Yummy, this recipe is a keeper! I want a margarita SO BADLY! Going to have to save this recipe for after Baby is born in June!